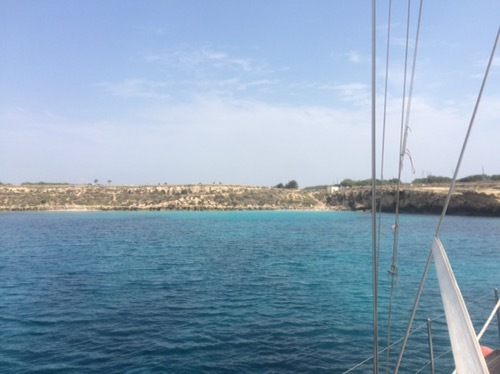 We left Pantelleria at 0630 on Thursday, June 23rd bound for the Egadi Islands off the west coast of Sicily. It should have taken us around 14 hours max but after a superb start sailing at 6 knots, the wind came round to be on the nose and also increased in speed. We made great progress when we were going in the wrong direction! We persevered and ended up motor sailing to try and be vaguely on course. It was slow going as the swell had increased as well. Our AIS is still not working so we were kept very busy crossing the shipping lanes in the Straits of Sicily. Eventually, we sighted the island of Favignana, our destination. Coming in was tricky because the light was going and there were a lot of fishing pots with virtually no markings at all. The last thing we needed was a rope wrapped around the propeller. We picked up a mooring buoy as it’s a national park and you’re not allowed to anchor after 6pm. It looked lovely but hard to tell as it was virtually dusk when we arrived. We were shattered so a quick meal of pasta and we went to bed. There was only one other boat in the bay. This morning we awoke to the result of the EU referendum and also this view. Amazing turquoise water amidst the volcanic rock. The place gets very busy during the day with people on the beach and day tripper boats but all quite pleasant. After a swim and breakfast, we decided to try and identify where a water leak was originating from. We think it is the reservoir box between the two tanks but we will confirm when we next fill up. Not sure where the day went but we didn’t get off the boat until 5pm and rowed towards the shore to do some exploring. We walked round the south eastern part of the island to check out the beaches including Bue Marino and Cala Rossa. We decided that none of them were as nice as the one we were in! There are a lot of mooring buoys scattered around the island but so far the one we are in is giving the best protection from the swell and wind. 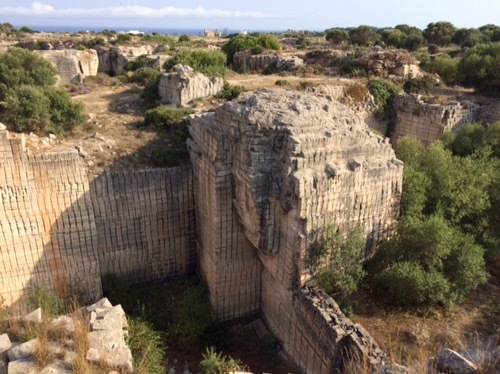 The island itself is volcanic and had a lot of quarrying in days gone by. Very weird gulleys and chasms that people now use to sunbath on. This entry was posted in News and tagged Italy, Med. Bookmark the permalink. Looks a very unusual place. Have fun!!! !